“See the line where sky meets the sea, it calls me. It might seem cliché but if there was a need to describe how many of us feel about this journey to Kure, the lines from Disney’s Moana seem fit for the experience. Given how remote Kure Atoll is, there’s no quick and easy way to arrive to the island besides the long ride up the Northwestern Hawaiian Island chain starting from Honolulu. With an extended trip after a stop off the shore of Laysan Island, the seven of us patiently sat aboard the M/V Kahana sailing up the chain in the final wait for our season to officially begin on Green Island within Kure Atoll. A cross somewhere between a reality TV show and luxury cruise, our time on the Kahana fell into an eight-day cycle of wake, eat, lounge on deck, eat, nap on deck, ice cream, eat again, watch the sunset, stargaze, probably eat some more, and finally go to bed. Besides the occasional moments of sudden restlessness, it seemed we all took to the required habits to be underway and the sway of the boat became normal. It helped that there was enough to keep us distracted between watching seabirds skim the horizon, gorging ourselves on delicious food we wouldn’t have for the seven months ahead, and keeping the jokes and banter going we seemed to hit upon during our first days on Oahu. Other highlights from our cruise include a phenomenal green flash at sunrise, a new perspective on stars and the moon, and a face to face with a giant ʻulua. As much as we have enjoyed the journey, one thing the voyage up the island chain teaches you is just how remote Kure Atoll really is. Looking at it from Google Earth you can conceptualize the giant blue abyss surrounding the speck Kure forms but to spend the time in that abyss puts it into a whole new perspective. The strange yet beautiful thing about the open ocean is that here you are, in this seemingly barren desert of water, with no sight of land in any direction, and, yet, you almost always see a constant stream of seabirds flying by. This is one of the things that attract me to seabirds personally. Their ability to traverse and fill the space nothing else has. It is proof of the feats and freedom they have accomplished in their many forms of flight and foraging. 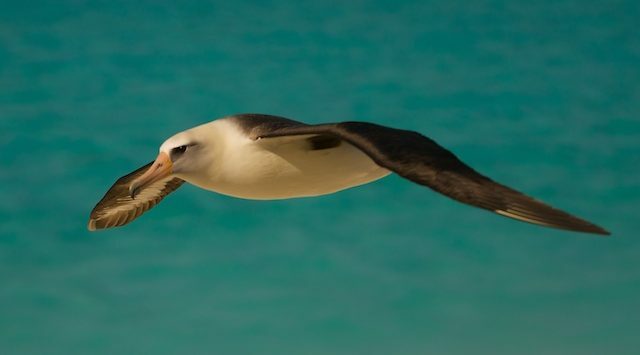 Shearwaters and albatross have harnessed the winds to travel thousands of miles with minimal effort, boobies utilize plunge-diving to catch fish out of reach from the surface, and frigate birds have mastered the art of sleeping on clouds in their week-long journeys never touching down. Moreover, all these birds somehow navigate this barren landscape by use of an internal compass and evening stars, returning to specks of land you can hardly make out on the horizon even when you are only a couple miles away from them. Birds we are passing could easily be circling down from Kure and making it back before we even get halfway there and, to me, that’s amazing. As the time aboard the boat comes to an end, we say goodbye to the last company we’ll see besides our crew all winter long. We take our last hot showers, we eat our last fresh food, all the while, you can see the urge to get to Kure grow stronger and the reach to know what lies at that line where the sky meets the sea grows more visible amongst us all. I have been fortunate to go there before and to see how far it can take us after, my hope now is to simply be a part of the journey with each of those experiencing it for the first time and seeing how this land of sand and sea teaches and touches them as it has me. And if there was any better way to start that journey, our first albatross gliding by during our final ship sunset and then waking up to flat seas and spinner dolphins nearby seemed like the best way to script an ending to the voyage to where we all cannot wait to be.